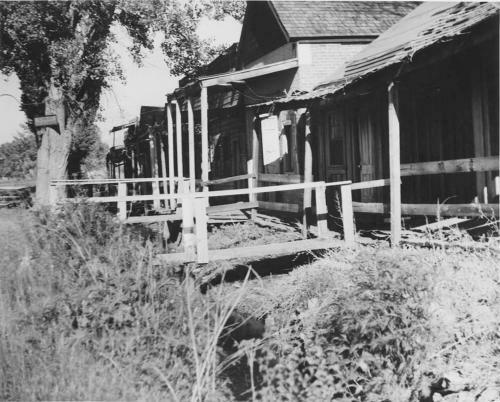 A look at Carson City's Chinatown, probably in the 1930s. By then Chinatown was run-down and strewn with weeds, and most residents had moved out. The whole neighborhood was razed in the 1940s. This view shows several storefronts next to an overgrown ditch. A wooden boardwalk spans the length of the street, with a few wooden planks crossing the ditch. Chinatown roughly straddled Third Street, extending a couple of blocks east of Stewart.